Windows Mobile 6.5 rolls-out tomorrow, so expect to hear about a bunch of new handsets this week. 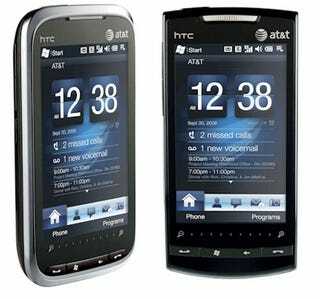 Getting in early, AT&T has gotten official with its versions of HTC's TouchPro 2 (Tilt 2; shown left) and Touch Diamond2 (Pure). The Tilt 2 is a QWERTY slider with "tilting" 3.6-inch WVGA touchscreen, dual speakers/microphones (with noise cancellation), and 3.2-megapixel camera. AT&T says it will be available in the coming weeks for $300 (after $50 rebate, with 2 year contract). The Pure updates the Diamond2's look, and has a 3.2-inch WVGA touch screen, 5-megapixel autofocus camera, expandable memory, accelerometer, and ambient light sensor. It's available now for $150 (after $50 rebate, with 2 year contract). Meanwhile, four new browser phones are also hitting AT&T, and they're the first to come pre-loaded with its new mobile browser. You'll be able to access the greater Internet (using data compression from Opera Software), and bookmarks can be created on the phone itself, or received from a laptop/desktop via att.net. The browser also has quick access to location-aware info (weather, restaurants, traffic, etc) and headline, sports and entertainment news. Samsung Mythic: A 3.3-inch touchscreen-only handset with Samsung's TouchWiz interface and access to AT&T Mobile TV, AT&T Navigator, AT&T Social Net, and att.net. Available in black come November for $200 (after $50 rebate; with 2 year contract). Pictured far-left. Samsung Flight: A Vertical QWERTY slider with touchscreen geared for one-handed instant messaging. Available in red or silver in November: $100 (after $50 rebate; with 2 year contract). Pictured center. Pantech Reveal: Arrives on October 18, and has a candy-bar style slide-down QWERTY keypad underneath a dedicated number pad. The Reveal is also 3G and GPS-equipped (with AT&T Navigator). No pricing/availability yet. Pictured far-right. Pantech Impact: OLED touchscreen with haptic controls (you'll feel a soft, tactile buzz). Flipping the phone sideways reveals a QWERTY keyboard and second display. Will have tri-band 3G and be available in pink or blue. Again, stay tuned for pricing/availability. (Not pictured).